Introducing you to our newest storage site... Ross-on-Wye! Situated by the River Wye, our Beyond Storage facility in Ross-on-Wye is an idyllic location. We provide the residents of Ross-on-Wye and the surrounding areas with a bespoke storage solution; one that goes above and beyond. This is where Beyond Storage was born, on the family farm, so you can be sure that we have a great local knowledge of this town, and we’re now going to share it with you. 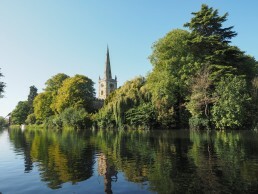 The spire of St. Mary’s church can be seen for miles upon entering this beautiful market town. As one of the largest churches in Herefordshire, it is definitely worth a visit if you are in the area. Dating back to the 13th Century, this is a monument of heritage in Ross-on-Wye. As one of the finest and best preserved of British castles, Goodrich Castle is an absolute must see when visiting Ross-on-Wye. Explore its fascinating history on one of the castle tours and exhibitions, relax in the delightful tea room and take in the sweeping views of the surrounding countryside from the battlements. Located at the top of Gloucester road, just before the Market place, No. 3 Restaurant & Bar in Ross-on-Wye is an easy location for a bite to eat. Offering fantastic food in a relaxed and comfortable environment, No.3 is a great option for lunch with the family or for a more intimate dinner affair. Using the best local produce, The Moody Cow is a great place to enjoy some home-made food at a reasonable price. With friendly service and comfortable atmosphere, this pub is full of character and the perfect place to come with the family (including the dog!) after dropping off your belongings with us. Beyond Storage offers the best storage solutions for our customers in Stratford. Whether you require self-storage due to moving home or renovation, or you are looking for storage solutions for your business, we can help. We understand that needing storage can be quite a timely decision, but we aim to make your experience with us as painless and as time effective as possible. We want to go above and beyond offering you storage solutions, which is why we have put together a list of things to do in Stratford to infuse a bit of fun into your day with us! For over 250 years, visitors have been welcome to go visit the birthplace of William Shakespeare. If you're visiting Beyond Storage to put your personal belongings into self-storage in Stratford, then make a special visit to the house where Shakespeare grew up, played and spent the first five years of married life with Anne Hathaway. Often referred to as the most romantic cottage in England, the thatched cottage of Anne Hathaway has been a hotspot for visitors for centuries. Enjoy the stunning gardens and the rooms where the young Shakespeare would have courted his future wife. Only a short distance from the town centre, Anne Hathaway’s house is a must for visitors coming to Stratford. Another fun experience for the whole family is Tudor World in Stratford. Drop off your belongings at our beautiful storage facilities in Stratford and head over to Tudor World to experience what life was really like during Shakespeare’s time. See what it would have been like to dine at an Elizabethan dining table and rest in their extravagant four-poster beds or experience what life was like for the masses at the museum. You’re in Shakespeare country! So, you might as well try out afternoon tea at the Royal Shakespeare Theatre. On a lovely day, you can enjoy watching the river boats go by out on the terrace or sit inside and choose from their self-service menu. What a great way to relax after a day putting your stuff into storage. Open all day, the Church Street Townhouse is a great place to take the family for any meal of the day. Stop off for breakfast before your appointment with us, or drop off your belongings at our storage facility in Stratford first and pop here for lunch! At Beyond Storage we want to do just that; to go above and beyond storing your belongings. Although we are your storage experts in Leicester, we also make it our business to know the area inside out, to help you have a better experience with us. If you’re making the trip to us, there’s no reason why it has to be a stressful ordeal. Therefore, we have created a list of some of the best things to do in this great City, from cultural experiences to eating out. Let us help you infuse some fun into your time with us! This one’s for the whole family. Have an ‘out of this world’ experience at the National Space Centre in Leicester, with 6 interactive galleries and 3D simulator experiences. It’s informative, interesting and fun! What better way to enjoy a day out with the kids? Found in the heart of Leicester city centre, Leicester Cathedral can hardly be avoided when exploring the city. The church was built on the site of a Roman Temple and has been a part of the community and religious life since medieval times. The Cathedral is open to visits most days, so pop in for a visit when you’re in the area! The winner of Leicestershire’s “Best Visitor Attraction” award, The Wistow Maze is a great day out with the kids. Drop your belongings off, or pick them up at Beyond Storage and go have fun exploring one of the country's largest maize mazes. With different themes that are forever changing, this won’t ever be a boring activity. The White Peacock is an independently owned restaurant dedicated to serving affordable but luxurious food in the heart of Leicester. With excellent customer service, you’re bound to have a lovely dining experience. Sit back and relax after a hard day organising your storage and enjoy some great food. For a more traditional feel, why not try the Dog & Gun? Situated in the unspoilt village of Keyham, Dog & Gun is a cosy English pub offering you a relaxed environment to enjoy some great food. With and open fire and welcoming cosy area, you couldn’t ask for a more relaxing place to eat after a stressful day organising your belongings. Tuesday 25th October - Half-term Fun Day. Special trails and activities all over the Museum for all ages. Children free admission. Drinks available. 11am to 3pm.